Kuwait National Petroleum Company (KNPC) is a wholly owned subsidiary of Kuwait Petroleum Corporation (KPC). KNPC operates three (3) refineries viz., Mina Al-Ahmadi (MAA), Shuaiba (SHU) and Mina Abdulla (MAB). KPC internal directives required the implementation of a management process to optimize energy consumption through the formation of energy management cells (EMCs), which implemented an energy management program based on best international practices. 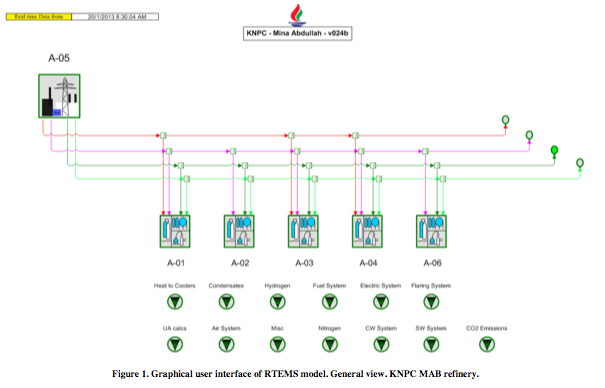 This paper describes the tasks performed to develop and implement real time, online models, to help with the three KNPC refineries energy cost minimization and energy management, which are scheduled to perform it automatically. They allow to clearly identify the different economic trade-offs that challenges the operation of the site wide energy systems at minimum cost while reducing the energy waste and, therefore, CO2 footprint. Recommendations given by the optimizers are taken into account by operations on a daily basis. The same models used for the online, real time optimization, are also used in standalone mode, populated either with current or historical data, allowing to perform case studies for planning or to evaluate alternatives for a better and most economical operation of the energy systems. As a result of the project, the information of each refinery energy system has been organized into models and reports to which everyone has access. It is Kuwait Petroleum Company (KPC) and its Subsidiaries policy to ensure that all energy will be managed in accordance with best engineering environmental practices and within regulatory compliance at all times [Ref. 1]. All operations must be committed to institute an energy efficiency programme and minimise the emissions of pollutants including global warming gases. As part of the activities to follow those premises, energy management cells (EMCs), have been formed at each of the Kuwait National Petroleum Company (KNPC) refineries: Mina Al-Ahmadi (MAA), Shuaiba (SHU) and Mina Abdulla (MAB). Such cells implemented an energy management program based on best international practices. This paper describes the tasks performed to develop and implement real time, online models, to help with the three KNPC refineries energy cost minimization and energy management. 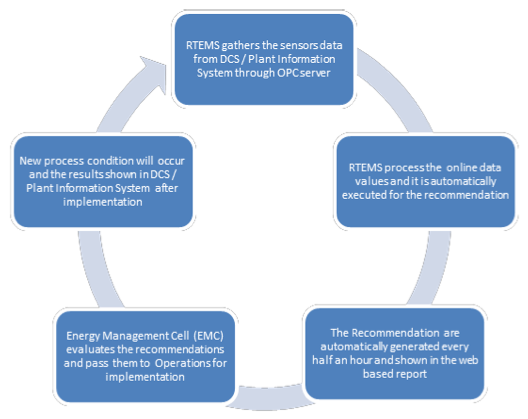 After describing the main project implementation tasks, the Real Time Energy Management System (ETEMS) functionalities are described and the optimization implementation procedures are commented. Finally, some obtained results are shown. The first stage of the project includes the tasks of data collection, control system review, software installation and detailed model scope definition. Control system review main goals are: to develop a good understanding of how the model optimization handles and process constraints are related through the site control system; and to identify any new control strategies or changes to existing strategies that are needed to implement the optimization. As a result of such a review, there is an alignment of the model with the real plant, making sure that the optimization suggestions can be properly implemented using the site's operating procedures, control strategies and control structure. Software installation is done on a computer server, accessing the historian data via a standard OPC DA/HDA interface. Software installation at PC clients is also done for client server access to the model and also to work with the model in standalone mode. In this stage, a document is prepared and approved with a detailed scope of the model to be implemented. 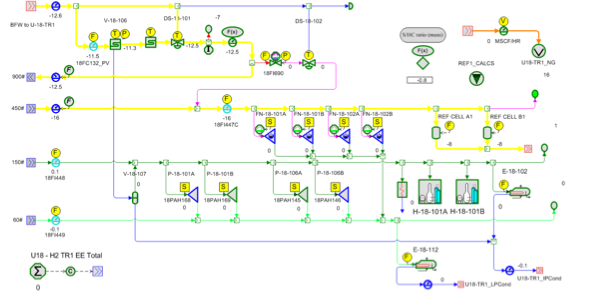 A detailed model of the steam, fuels, electricity, emissions, boiler feed water and condensates systems has been built, including all the interactions among these systems, real plant constraints and degrees of freedom of their operation. Other utilities systems have been also modeled for monitoring purposes such as air, nitrogen, flaring system, cooling water, sea water and hydrogen networks. Such a model is scheduled to perform automatic executions for the optimization of the entire system and is continually populated with validated, live plant data. Recommendations given by the model are taken into account by operations on a daily basis. The same model used for the online, real time optimization, is also used in standalone mode, populated either with current or historical data, to perform case studies for planning or to evaluate alternatives for a better operation of the energy system. Figure 1. Graphical user interface of RTEMS model. General view. KNPC MAB refinery. A midpoint review is done to review the model and optimization with users. At that time the users' training is done. The usual way operators receive the set of recommendations is through a custom report. Figure 2 shows an example of such a report which corresponds to KNPC MAB refinery. The EMC group contact every day the shift supervisor for coordinating and follow-up the changes. This stage corresponds to the site acceptance test that is the check-list review of the functionalities required by the RTEMS. Along this stage, a full document is prepared and delivered with all the details of the system implemented, including troubleshooting and maintenance procedures. Benefits already obtained are also analized and reported. After the commissioning, the sustainability period begins with the main objective of sustain the benefits along the time. One of the main objetives is to operate the energy system at the minimum cost taking into account all the available resources and the real operational constraints (Ref. 2). Since the energy system is highly nonlinear and includes continuous and discrete optimization variables, it requires a Mixed Integer Non Linear optimization technique. 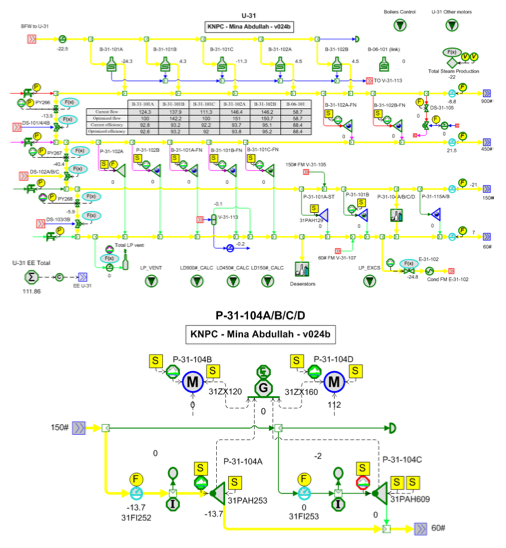 The calculation core of the system is MESA (Modular Energy System Analyzer). For the solution of continuous nonlinear optimization problems, MESA employs an implementation of the Sequential Quadratic Programming (SQP) algorithm, developed by Dr. Leon Lasdon (Ref. 3). Lasdon's SQP solver has been fine-tuned specifically for the characteristics of energy system optimization with particular emphasis on robustness and speed. MESA uses a technique loosely based on "Relax and Cut" to deal with mixed integer nonlinear optimization problems resulting from the start/stop decision of equipment. In this technique, all integer decisions are converted to continuous variables by relaxing the bounds of the associated variables. This reduces the problem into a nonlinear continuous optimization problem that can be solved using Lasdon's SQP. This method has been highly adapted to suit the characteristics of steam, fuel, and power optimization on a real time basis, especially taking into consideration the time it would take to solve the mixed integer problem. A set of screenshots from the RTEMS graphical user interface corresponding to the Delta views, showing and highlithting the differences between actual and calculated optimum operating conditions is presented in Figure 3. It can be observed part of the recommended solution: reduction of the total steam production at the fired boilers while balancing them, one of the recommended pump swaps in a process plant area and the resulting reduction in steam letdowns. The hexagonal blocks with mountain icons inside shown in Figure 3 are optimizers blocks. Such items are used to define and configure optimization variables or degrees of freedom linked to the corresponding equipment. Furthermore, when they are colored inside, it is indicating the optimizers are at a limit, being one way to visually highlight the constraints the optimization is hitting during a given optimization case. The Delta views are very useful to analyse and understand the optimization solution by navigating through the model, being configurable the threshold to show the changes and corresponding coloring code. Other interesting example corresponds to KNPC MAB refinery. In this case, a significant reduction in low pressure steam excess (venting and/or condensing) has been achieved after applying the RTEMS optimization solution on a daily basis. Figure 4 shows the Delta view to illustrate this case of real time optimization. It can be observed the significant reduction in the excess of low pressure steam sent to the condenser (24.8 klb/h less of low pressure steam to the condenser, in this example). Among the optimization actions, swaps between steam turbines and electrical motors have been done. As an example, in the same Figure 4, it is shown a group of turbines and motors giving the same service where the start of steam turbine and shutdown of an electrical motor was recommended. By using the model in stand-alone mode, it helps to evaluate potential capital or operating changes to the complex and assess the economics and operability of the changes. During a What-if study an actual site status (or also the corresponding calculated optimum) can be compared with the optimum case study and easy analyze how this change impacts on the site and how to operate the energy system after that change. All imbalances are maintained constant and the steam production is allocated to the new demand / request proposed scenario. An example of these kind of studies is the following. It has been evaluated the impact on utilities system of reducing the Medium Pressure steam (450 psig) to the reformers. In this case, 16 kph less (8 kph to each cell) is sent to the steam methane reformers so a reduction of 0.8 in the Steam to Hydrocarbon ratio (S/HC ratio) is obtained. It was observed a decrease of 900 psi steam to the network from the unit (in this case 12.5 kph) and a decrease of Fuel gas consumed. The corresponding effect on the power plant is a decrease in steam letdowns and low pressure steam vent and/or steam to condensing. Figure 5 shows the Delta View from RTEMS graphical user interface (differences between actual and comparison cases are highlighted). The auditing and monitoring of the energy system is an important task that the RTEMS carries out by helping in the follow-up of key paramenters such as equipment efficiencies and energy cost savings, and also in the validation of data. The potential gap between the current/actual operating costs and the minimum/optimal operating costs is also calculated and historized. The savings associated with this gap will be materialized only if all the suggested optimization movements are implemented simultaneously. These predicted savings constitute one of the main economic Key Performance Indicators (KPIs). It is expected that, if the operators implement all the proposed recommendations on a continuous basis, the potential gap will start decreasing over time. If in the future the system is in a new condition, a new potential gap will re-appear until the operators make the optimizing movements, and the cycle is repeated. If the projected savings are consistently high, this should prompt Management, Supervision and/or Engineering staff to identify any issue that is impeding the capture of the costs reduction. Other important KPI is related to equipment efficiencies. Figure 6 shows an example of a report of a set of process heaters. The model calculates the incremental cost for the fuel burnt. Such a report allows prioritizing the actions to improve combustion based on economic impact. Wherever there is a closed -mass, or mass and energy balances- the RTEMS calculates a real-time balance offset or bias (the so called balloons, see Figure 7) as the difference between the inlet and outlet streams to/from a given header. Big imbalances are visually identifiable (the size of the balloon increases and/or the color dynamically changes). Either visually or in a report, the RTEMS will flag these large imbalances to the user who can then focus maintenance attention on the meters associated to that balance. If a particularly important sensor fails in the validation test, the RTEMS could automatically shut down optimizers or force those constraints to which it is related or even shut down the entire site optimization. 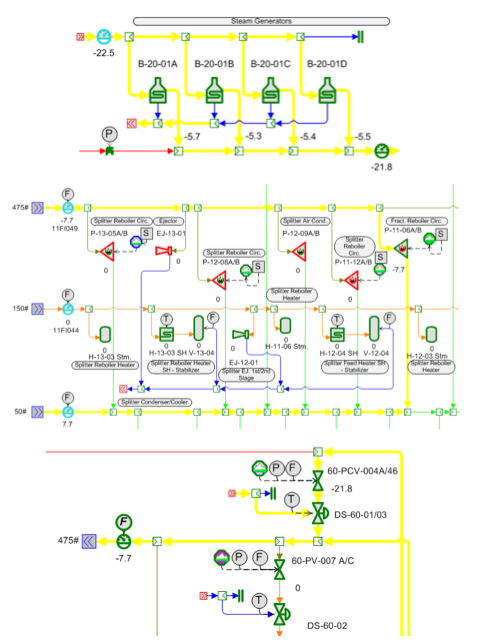 Operations apply on a daily basis, under the EMC supervision, the actions calculated and recommended by the RTEMS in order to minimize the total operating cost, following the implementation procedure shown in Figure 8. Figure 9 shows the reported results from one of the refineries (KNPC MAA). The base case was established when the model was completed in May 2012 with energy cost savings opportunity of about 680 $/hr. 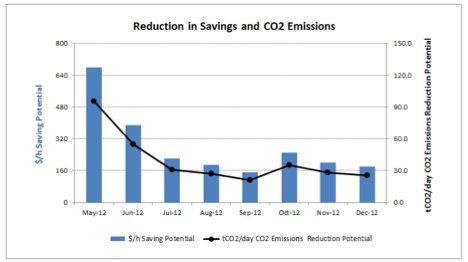 By the end of December'12 the energy cost savings potential were reduced to about 180 $/hr reflecting obtained savings of about 500 $/hr (4.4 MM$/year). Figure 9. CO2 emissions and economic potential savings. KNPC MAA refinery. Their reduction corresponds to obtained savings. The tasks performed to develop and implement real time, online models, to help with the three KNPC refineries energy cost minimization and energy management, which are scheduled to perform it automatically, have been described. They allow to clearly identify the different economic trade-offs that challenges the operation of the site wide energy systems at minimum cost while reducing the energy waste and, therefore, CO2 footprint. Recommendations given by the optimizers are taken into account by operations on a daily basis. As a result of the project, the information of each refinery energy system has been organized into models and reports to which everyone has access. It has been also observed that having a model of the whole refinery energy system validated with real time data, in one environment that everyone has access to, also to understand all the decision variables and the associated constraints, which sometimes are hidden or ignored, helps in the coordination among plant areas in order to increase energy efficiency and reduce total energy costs. 1. KPC HSE Standard Doc-18 (Management of Energy & Resources). 2. Use of Online Energy Systems Optimization Models", D. Ruiz and C. Ruiz, Book: Energy Management Systems, ISBN 978-953- 307-579-2, edited by P. Giridhar Kini, Chapter 4, pp 85-100. InTech, 2011. 3. Experiments with Successive Quadratic Programming Algorithms, Y.Fan, S. Sarkar, and L. Lasdon, Journal of Optimization Theory and Applications, Vol. 56, No. 3, March 1998.